Ministers have defended the cost of building city academies, saying they are the same as other similar schools. It has often been said that academies cost far more. Last year the Commons education select committee said their start-up capital cost was "significantly beyond that of other new schools". But the government said some non-academy schools now cost up to £35m, more than the average for an academy of similar size and location. In its report, the select committee questioned the wisdom of investing so much public money in untested types of school. But a spokesman for the Department for Education and Skills said academies were built to similar specifications as other state schools. The select committee had used the wrong basis for its calculations, he said. "The average cost of a new secondary school with 1,300 pupils and a sixth form in a high-cost inner-city area is £25-30m and some non-academy schools now under construction are costing up to £35m," he said. "The average cost of an academy, of this size and location is similarly £25-30m." About half of the academies that were open were in London and most were on restricted, "brown field" sites. "It is absurd to compare the average cost of a 1,300-pupil academy, built in high-cost, inner-city areas, with the £15m, historic average price tag for a 900-pupil secondary school in a moderate cost area," he said. "You might as well equate the cost of a two-bedroom house in a market town with a four-bedroom house in central London." The department was asked to provide actual cost comparisons. It says most recent secondary schools have been built under private finance initiative schemes, so construction costs are "commercially sensitive". It declined to name any current non-academy building projects as it said it would be unfair to drag those schools into the debate. But a spokesman said one school under construction in an outer-London borough was costing £35m and another in inner London, £33m. The department said the cost of academies was given in a parliamentary answer last year, when 17 had been opened. This showed a wide range, from £16.5m to £38.5m in two London boroughs, Haringey and Bexley. In the first case the sponsors, the Greig Trust and the Church of England, put in £2m or 12% of the total, for a secondary school for children aged 11 to 18. 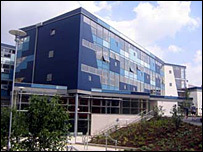 In Bexley the sponsor, Sir David Garrard, pledged £2.4m or 6%, to build an "all-through" school for children aged from four to 18. The biggest percentage contribution by a sponsor was the £2.5m or 14% put into Walsall academy, which cost £18.2m, by the Mercers' Company and Thomas Telford Online - an arm of the city technology college in Shropshire. In the Djanogly City Academy in Nottingham, the sponsor Sir Harry Djanogly pledged nothing. The reason given for this is that the adademy was an extension of the existing city technology college he had sponsored, so he was not required to contribute again. The figures are what sponsors pledged. MPs were told in February this year that donations were "normally made over the lifetime of the building costs of the project" - so in some cases a number of payments were still to be made. In the case of Bexley, for example - which opened four years ago - Sir David Garrard had committed £2.4m but as of February the contribution of his education trust had been £947,000. The government has set a target of opening 200 city academies by 2010, with 27 in place so far.